Today I am going to shift gears a bit from ITPro\Admin topics to a dev based topic. 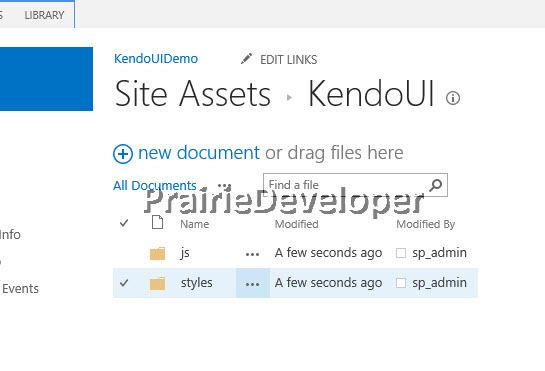 I would like to show you how to customize SharePoint forms with KendoUI Grid. 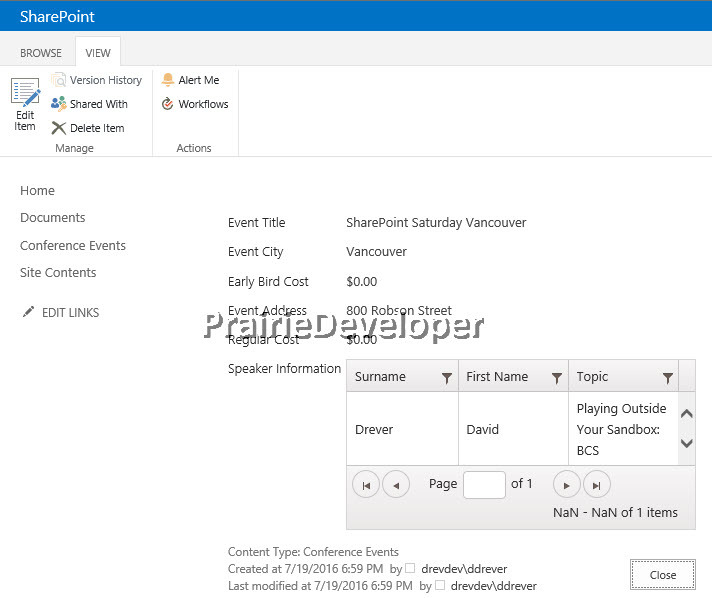 Everything I cover in this post can be done in either SharePoint On-Premise or SharePoint Online (O365). 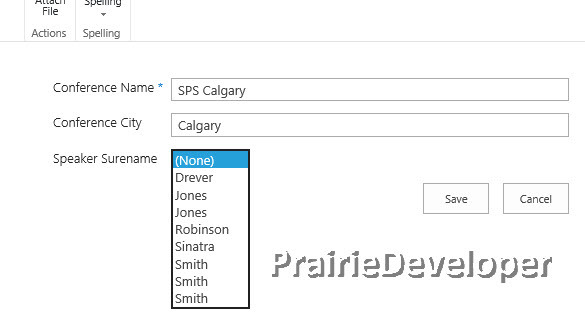 SharePoint is nice enough to place them in order for us, but can you tell me which Smith I am selecting? So obviously the OOTB form was out, but there are still a number of options. One of these options would be an InfoPath form, but I don’t want to encourage the use of that tool. Today instead I am going to show you how to use KendoUI to handle this. I have used Telerick’s tools in the past and really found them robust and fairly easy to use. The KendoUI tool set is no exception in my opinion. 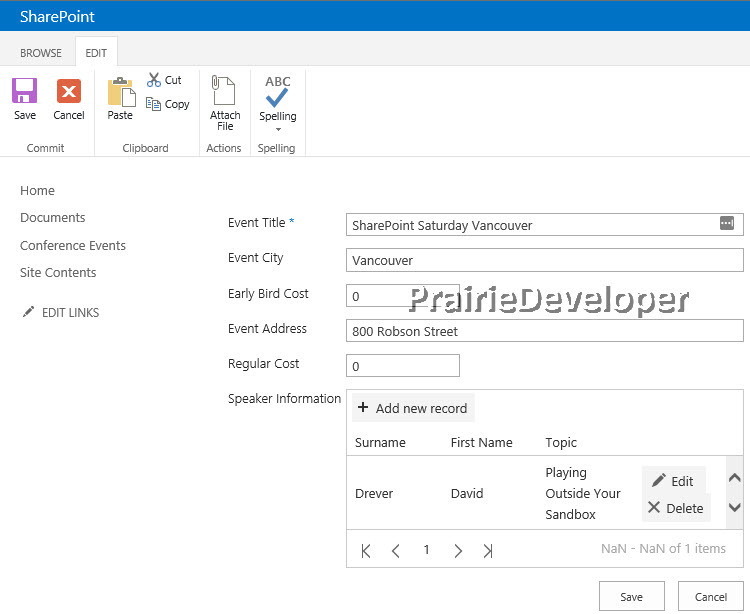 The tool set allows for great integration with SharePoint using REST and also has hooks for the AngularJS developer. 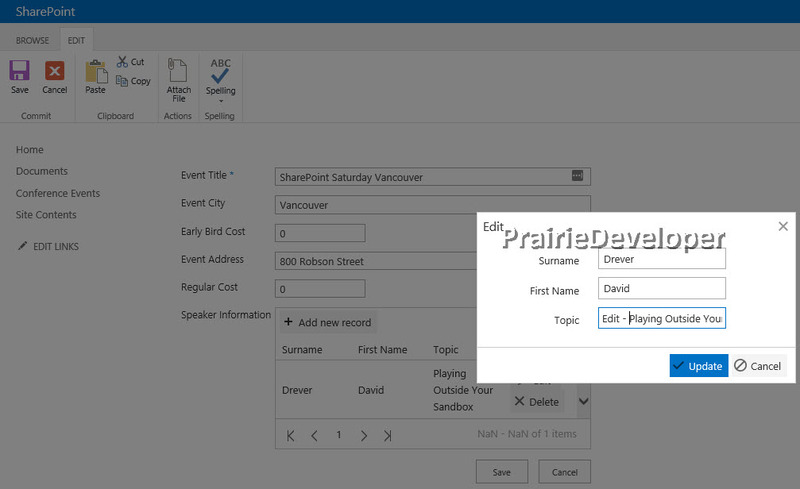 Next, setup the field you want to use to store the data as a multiple-line text field. If you use a single line, you will not be able to store many entries as the maximum number of characters will be reached quickly. VERY IMPORTANT: “Multiple lines of text” fields default to rich text. Change it to plain text, otherwise the code you need to write to clean-up of the data that is passed to the grid will be awful. O365 Note: Before getting to #1, you first have to click on the settings “Cog” and then click Edit Page. The options below are not available to you unless the page is in edit mode and SP Online doesn’t do this automatically for you. On the edit screen select Add a Web Part. 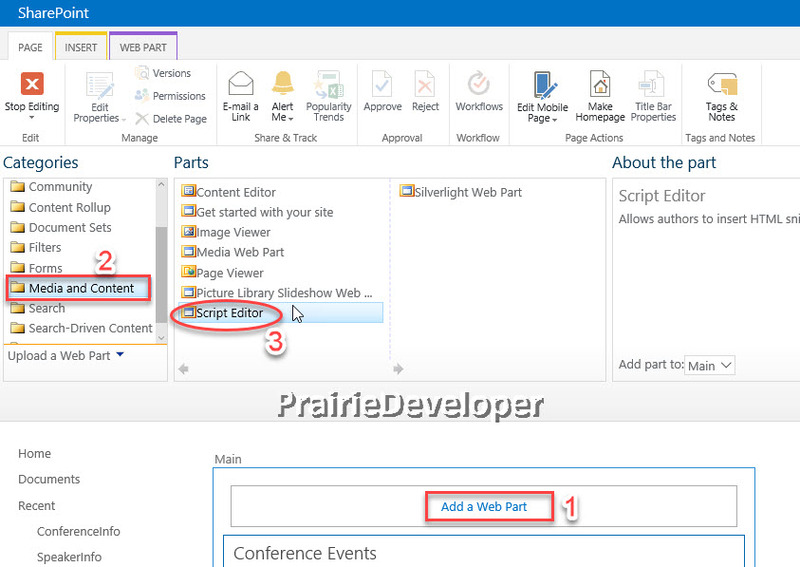 Select Script Editor Web Part. 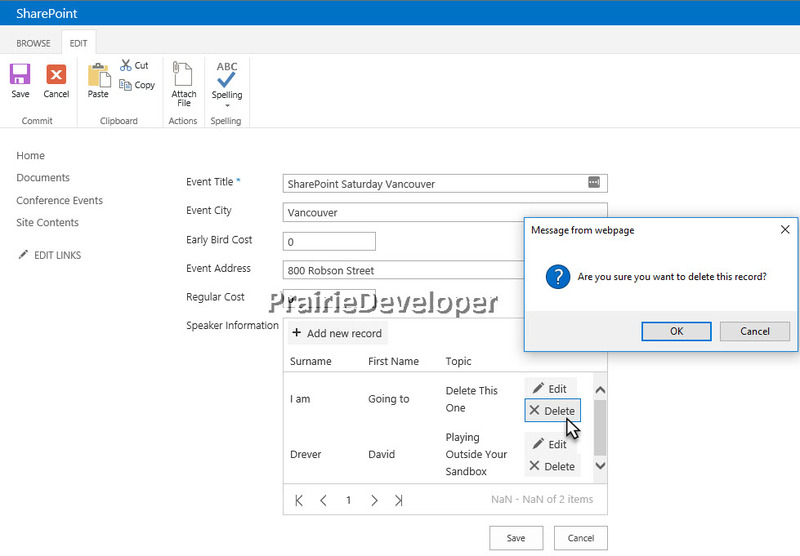 Repeat the above steps for the Display and Edit forms. I’m going to provide the full code script at the end of this post so if that’s all you really want then scroll down. However, if you don’t mind me rambling along about why I did a certain thing or how I wrote the solution, then I beg your indulgence and please continue reading. First off you are going to notice I am using two global variables. While it is not a absolute no-no, it is frowned upon and discouraged. The variable speakerDataArray is an array that will hold the grid data. We need this because we are not wiring the grid directly to a data source. So this source needs to be available within all scopes. The other one is the tableNextID. This is simply a holder for the next ID in the table. I could have written code that scanned the table and returned back the latest ID used, but using the variable is a lot less overhead. So the first function is our CSR (Client Side Rendering) declaration. In this case I am effectively stating that I want to change the field “SpeakerInformation”. When I modify that field I want to do it with the function “renderNewItems”. 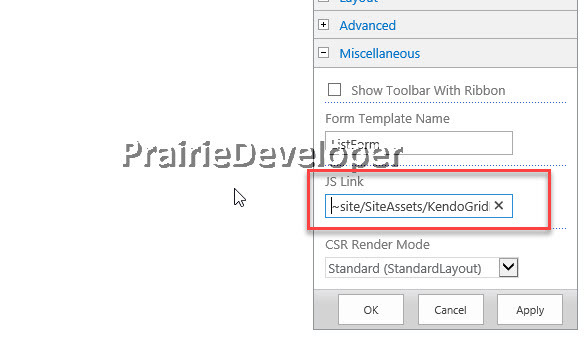 The client would detect the type of form the user was in and call the appropriate function\method. The function renderNewItems builds out the structure we want the field to look like. If I wasn’t using a grid, I could change it into a dropdown or pretty much anything. In this case I change it to a table so the grid can integrate. In the data source we declare how the grid should handle the different types of processes against it (displaying, editing, inserting, etc). We also define the model. This is where that global variable is used. 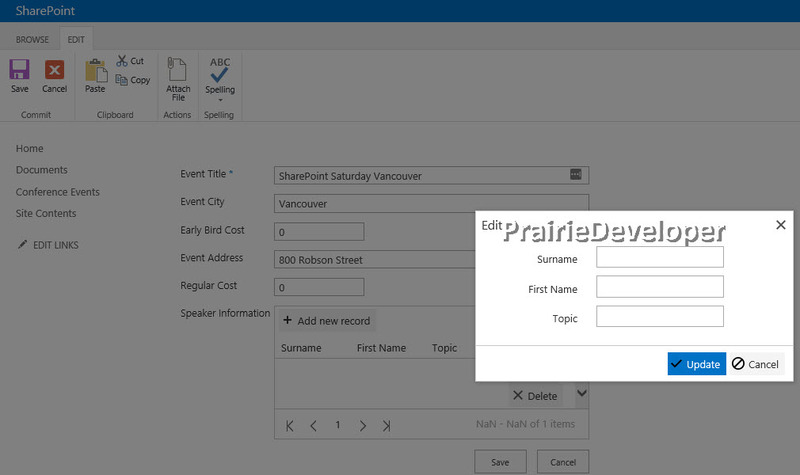 Normally the grid would connect directly to the data source via REST or a direct connection but in this case, I am converting the grid data to place it into a text box so those options aren’t available. So we are going to store the data in that global array so I can massage it for storage in the list. //Create the Kendo Grid with the data for the users. Pretty straight forward. Remember that table I created in the renderNewItem method? I am grabbing that here and applying the grid to it. 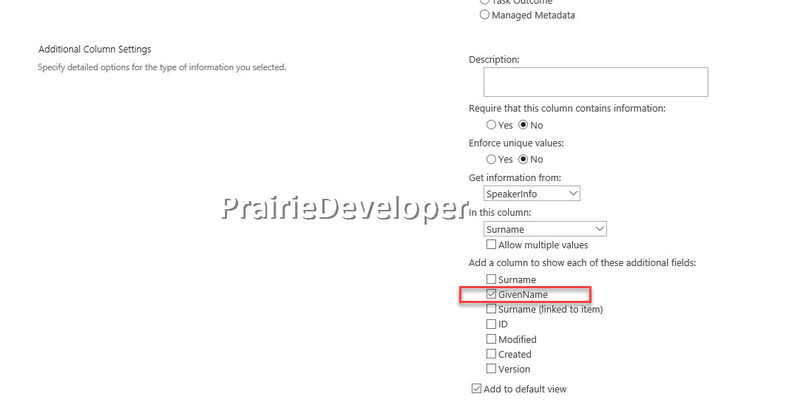 Declare where it gets its data from, and setting some other options including the columns. That’s pretty much it. I have a couple of other methods in the script file that are pretty straight forward. They simply massage the data so it can be stored in the list and in the grid array. Removing the speaker ID field from the data as we don’t need that (the SpeakerID field is just there to keep things straight in the grid), etc. If you download the scripts you can take a look at them there. So what does this code get us? Obviously you are going to want to present the Speaker Information column a bit differently, but that is a post for another day. 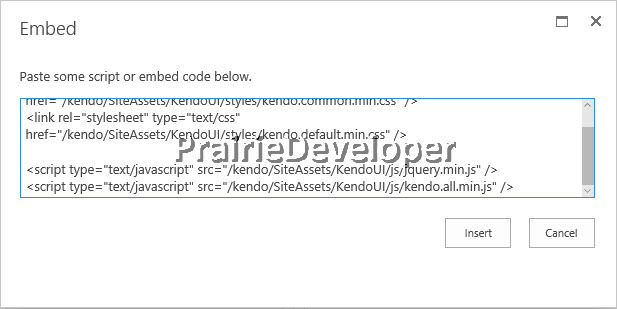 The code while very similar for the display form page is a little bit different. This is because when defining the data source, we are not providing any methods for modifying the data. Just for displaying the data. So the script is actually quite a bit smaller than the new and edit forms. As you can see we just tell the grid where the data source. 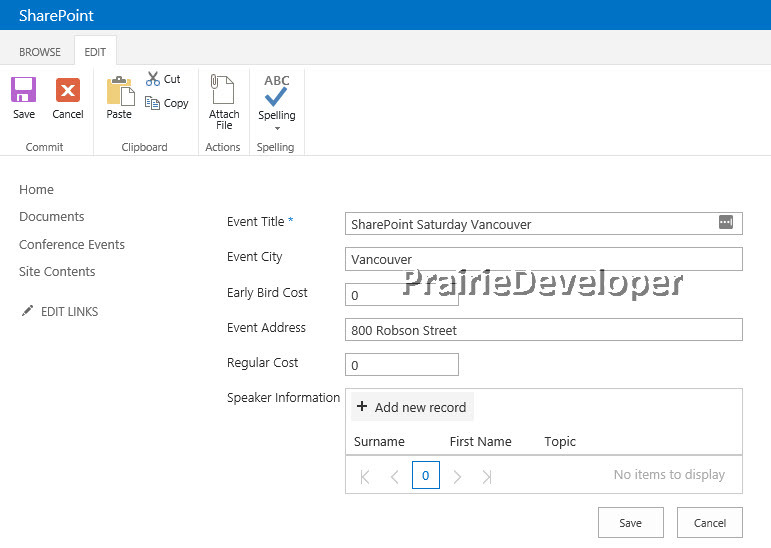 When you download the script files (if you do) you will see the makeTable isn’t doing much with the data, just grabbing it directly from the SharePoint form and removing the div data within. This is because “multiple lines of text” fields store their data in a div. When added to the form, it gives you a read only version of the grid. This was a long post and I thank you for sticking with me. Please fire a comment if you have any questions about the items I covered here. As promised you can download the scripts here. Use them as you will, but if you use them in your own presentations or blog I ask that you do provide credit where it is due. Great article! I just want to add one interesting fact – that Kendo is being used by over 130k clients all over the world.